← What’s new for 2012? new contests, designer cards, and critical book reviews. Well, I can assure you that I likewise spent my weekend slaving away on my upcoming projects in order to have them ready for all of you in the upcoming weeks! I’ve decided to start us off with a little bit of fun, namely, dingbat greeting cards. For those who are wondering what in the blessed heavens dingbats are, check out my last blog detailing what they are, and also what ours are all about. Our dingbats have a pretty interesting story, and I’ll think you’ll like it. So go check it out! But now, time for some whats-it, thingie-ma-bob, do-hickey, dingbat cards! 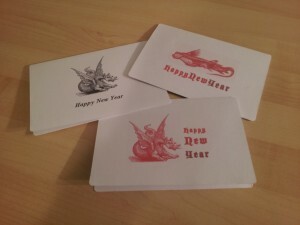 To start, inspired by the Chinese New Year, I made a few new years cards. I took the dragon images from our Miscellany page and played with different fonts and colours. 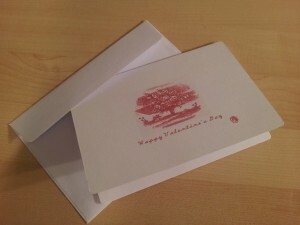 Red was an obvious choice for these cards, and to spice it up a bit, I added gradations of the red to the text. 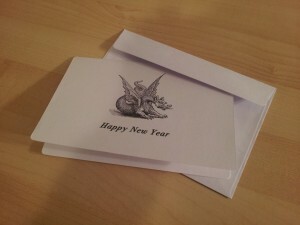 The dragon dingbats made great cards for the Chinese New Year. Next, I picked one of my favourite dingbats and made a winter card. 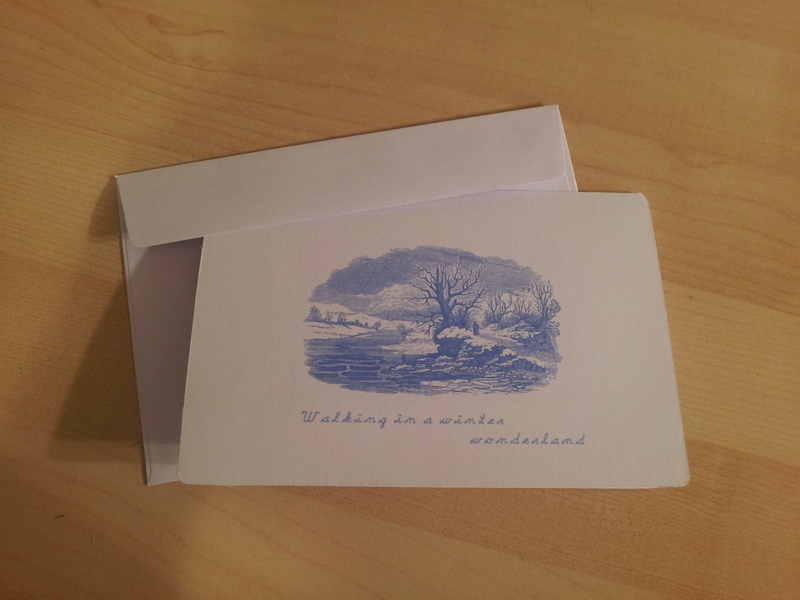 This dingbat is so pretty, with the bare trees, evocative sky, and lone traveller, that I couldn’t help but make it into a card. I picked a thin, flimsy text here to match the trees’ bare branches. This winter scene is one of my favourite dingbats. That is, after the goat of course. I also thought the roses would make a nice Valentine’s Day card. If you check out our Miscellany page, we have a few images of roses. I used the same font here as the card above and I cut and copied one of the roses from the bush to put in the bottom right corner. 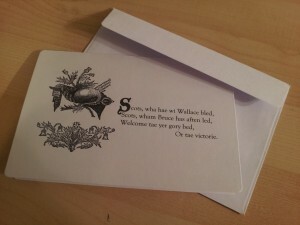 Nothing says 'I Love You' like, erm, a handmade, nineteenth-century dingbat card. Lastly, (I’m the first to admit this got a little out of hand) I made a Bobbie Burns card, for the upcoming Bobbie Burns Day. For this one I borrowed the image of the bagpipe from our Miscellany page, and one of the thistle tailpieces from our Tailpieces page. We have a lot of thistle tailpieces. Several of them were actually used in Jon Evans' Beasts of New York. And if only that were all … with so many holidays to come, I’ll have a bunch more cards to show off as the year goes on. If my inspiration has likewise inspired you, I assure you, these were so easy to make. I bought the blank cards at Michaels, the massive chain craft store, for only $5 a pack. I’ve heard through the grapevine that Walmart also sells blank greeting cards. I measured the cards once I got home and I used the dimensions to create a new page layout in Microsoft Word. (Go to Page Setup, and choose Manage Custom Sizes from the Page Size drop-down menu.) Once I had my new page layout, I simply downloaded dingbats from our website, and pasted them into the page. I changed their colours using Gimp and changed their sizes as I liked in Word. I added text boxes where I wanted text and then I just put the blank cards in my printer’s paper tray, and the printer did the rest of the work! Keep watching this spaces for our upcoming Devil’s Artisan contest! Until next time … Porcupette out! This entry was posted in Letters from the Porcupette (the Intern's Blog) and tagged Chinese New Year, dingbats, Do It Yourself, Robert Burns Day, Valentine's Day. Bookmark the permalink. Your cards is so nice! Thank you kindly! Feel free to give it a go yourself . . . it’s a lot of fun!